From the Beer Writer: I am a writer. I love language. More than that, I love the things you can do with words, letters, and plays on both. I’m particularly fond of palindromes, or words that are spelled the same way backward and forward. (Yes, I’m a nerd… what of it?). So it’s pretty fun to come across a local beer employing one in the naming of a special collaboration. That beer is RegalLager, and it was brewed by Mission Hills outfit Latchkey Brewing for nearby bar and after-work hang, the Regal Beagle. But there’s more to like about it than its clever name. RegalLager is a German-style festbier, another thing I am very fond of and, thanks to the changing tastes of craft beer enthusiasts, have been able to find in much greater plenitude this year. Regal Lager is the latest in a nice line of slightly bready, abundantly yeasty, and amazingly drinkable Oktoberfest-inspired lagers I’ve come across over the past month. Each is slightly different in terms of color, sweetness, and yeast character, and that’s what has made tasting them so enjoyable. With Germany’s Oktoberfest period coming to a close this Sunday, this figures to be the last local version of this style I come across. It’s extremely fresh and a nice way to say auf wiedersehen to these lagers. You can do so tomorrow when Latchkey celebrates the opening of its tasting room patio. 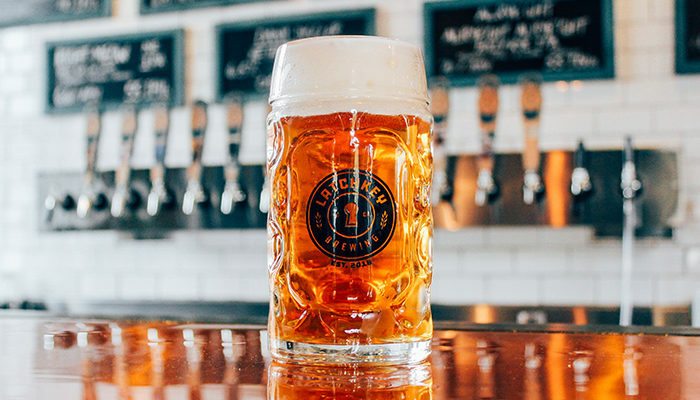 RegalLager will be on tap along with four other German-style beers, and Regal Beagle will play the part of collaborative reciprocator, catering the soiree with its well-suited, sausage-focused cuisine.